For close to four decades now, the Nepean Concert Band (NCB) has performed for residents of the National Capital Region. It has evolved from its origins as a secondary school night course to become one of Ottawa’s finest and best-known community bands. Over the years we’ve had four conductors – Bob Clarke (1975-1977), Hans Van Gijn (1977-1985), Jiri Hlavacek (1985-2004) and Terry Duncan (2004-present). Currently under the direction of Terry Duncan, the band has expanded its membership to approximately 60 volunteer musicians, from all walks of life. The NCB musicians enjoy playing a diverse repertoire which might include marches, popular fare such as folk, Big Band and Broadway selections, classical transcriptions and contemporary titles written expressly for wind ensemble. Over the years the NCB has participated in music festivals within the Ottawa area, such as Kiwanis Music Festival and MusicFest Canada and has attended the National Finals of MusicFest in Ottawa, Gatineau (QC) and in Toronto. Beginning in 1988, the NCB performed once (sometimes twice) a year at Ottawa’s Centrepointe Theatre. Since 2012, the band has been presenting ts formal concerts at several local churches (including Britannia United, City View United, etc.). 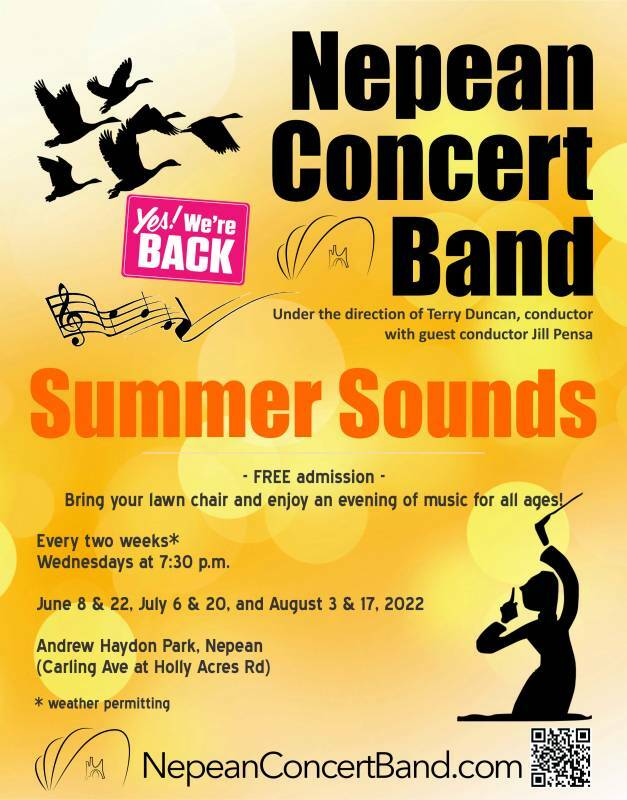 During the summer, the NCB presents a bi-weekly “Summer Sounds” series at Andrew Haydon Park (Carling Avenue & Holly Acres Road) on Wednesday evenings from early-June to mid-August. You can also catch the band at numerous civic events and at seniors’ residences. The band has enjoyed trips to Bath, Maine (several exchanges with the Bath Municipal Band) and the Lakeshore Concert Band (Dorval, Quebec). The NCB has hosted several “community band days,” since the late-1980s (with participating bands from Ottawa, Quebec, and throughout the Ottawa and Seaway Valleys) and has participated in the Lake George Community Band Festival (Lake George, New York) since 2007. Rehearsals are held on Wednesday evenings from 7:30 to 9:30 PM, at the Nepean Creative Arts Centre (35 Stafford Road, Ottawa, ON), and although we work hard at these sessions in order to improve our musical abilities, the emphasis is also on fun and connecting with fellow musicians. The NCB is a provincially-registered non-profit organization and depends upon membership fees, concert revenue, and sponsorship from patrons in the public and private sectors, to pay for necessities such as the conductor’s honorarium, rental of rehearsal space, equipment maintenance and renewal and the purchase of quality repertoire. Terry Duncan discovered a love of conducting at Queen’s University where he studied trombone performance and composition and has since furthered his studies in conducting at the University of Calgary. Terry is currently a music teacher at Woodroffe High School in Ottawa where he conducts the Wind Ensemble, the Symphonic Band, the Stage Band, and directs musical theatre productions. Prior to his work with the Nepean Concert Band, Terry served as conductor for the Brockville Concert Band and Carleton University Concert Band. Terry is very active in local theatre productions and has served as Musical Director for the Orpheus Musical Theatre on three productions in addition to the roles he has been fortunate to hold on-stage. Terry has been full-time conductor of the Nepean Concert Band since September 2004. As with all great things, some conditions apply. Membership is based on a number of criteria, mainly the musician’s ability to perform level 4-6 concert band selections, willingness to attend rehearsals each Wednesday evening, and prompt payment of Band dues. For musical balance, performance continuity, and space logistics, we reserve the right to limit section size. The sections are monitored by the section leaders who decide the placement and balance for their teams. The members must maintain a high level of playing ability to maintain consistency and musical quality for everyone. Regular membership is $100 (pre-paid annually), or $35 for four months. Students and Seniors (65+) pay $70 annually, or $25 for four months. All members who pay dues annually receive a $5 discount. Attire is casual for regular rehearsals. Formal concert uniform consists of a white NCB-crested golf shirt, black pants or skirt, black nylons/socks, and black shoes. For summer performances, the summer uniform consists of the white NCB-crested golf shirt and black shorts or pants.